A tool is simply a machine which makes work easier. Most tools provide ways to shift or focus energy. For example, blades (edged tools) allow people to focus a great deal of energy into a very small area (the edge). They come in a vast array of configurations from surgeon’s tools, to carpenters tools, to kitchen knives, to pieces of industrial equipment. As a student of our system, you can expect to become an expert in edged, impact, and projectile tools for self-defense, and to aid in defending against these tools when they are used as weapons by assailants. While we don’t teach firearms courses, we recommend our students have at least a basic firearms safety course in order to render a firearm safe in case they encounter one outside of a training scenario. Our edged and impact tool curriculum are heavily influenced by the martial arts of Southeast Asia, including arnis, kali, escrima, and silat. The cultures that gave birth to these arts still utilize these tools for warfare and police-work today. Many of their unarmed and tool-based systems are highly evolved. 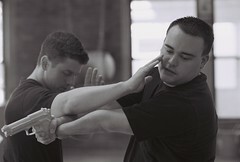 As an eclectic martial art – we incorporate what we find to be useful and necessary. We are also influenced by our historical connection to the samurai warriors, who were specialized in combat against other skilled warriors wearing armor.